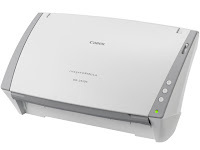 Canon has announced brand new scanners that are now available in the US. The ImageFormula DR-2510C and ImageFormula DR-2010C are the latest addition to the DR Series of scanners. Color scanning speed on the Canon ImageFORMULA DR-2510C is around 25 pages per minute while on the Canon ImageFORMULA DR-2010C, it's 20 pages per minute. Other features that are present on both devices include: Automatic Color Detection, Automatic Page Size Detection, Skip Blank Page, Deskew and Text Orientation Recognition. Plus, the Canon ImageFORMULA DR-2510C features Ultrasonic Double Feed Detection. The Canon ImageFORMULA DR-2510C and Canon ImageFORMULA DR-2010C includes bundled software such as: CapturePerfect 3.0, Adobe Acrobat 8.0 Standard, ScanSoft PaperPort SE, OmniPage 4SE, and Presto! BizCard. The Canon ImageFORMULA DR-2510C and DR-2010C is now available at authorized Canon Dealers with suggested retail price of $895 and $795, respectively.